For anyone who has enjoyed this game in a game parlour, Rainbow Riches now comes available to you on Android. With plenty of Irish flavoured slot fun, this game offers you some odd bonus features that may not play out quite as you expect but will still pay you out some winnings. 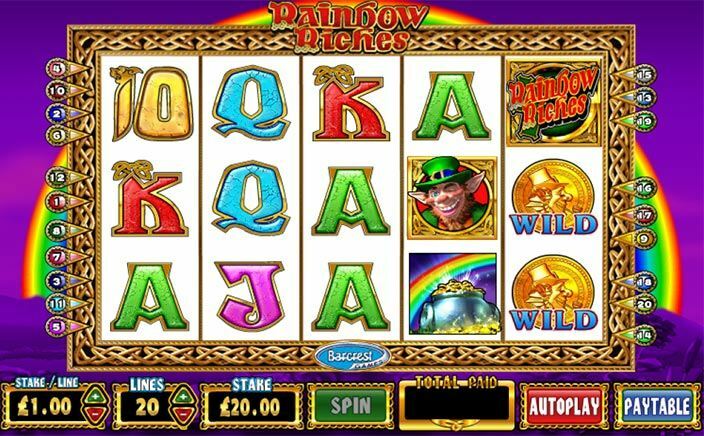 Rainbow Riches is a slot game by Barcrest, a game developer that has been in business since the ‘60s, creating games for land based casinos and gaming parlours. Of late, their foray into the online gaming world has been extensive, but sometimes leaves a bit to be desired. The graphics are somewhat eerie and feel strange and old, but the game itself plays out great on your mobile phone. 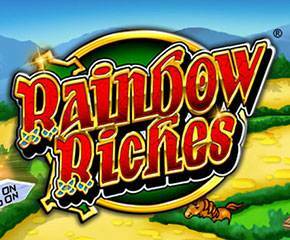 Rainbow Riches has 5 reels and 20 paylines and is based in a pure Irish backdrop. There’s a strange looking leprechaun who seems hell bent on insisting that you accept some of the treasure that he is trying to get from the end of the rainbow. You can choose your wager and then spin the reels to see exactly how much you can expect to win from the reel symbols and the bonus features of the game. Wild substitutions: You can use the wild symbol to replace other reel symbols so that you can get a wager multiplier of 500x if you get five of them as matching symbols. Stacked symbols: In Rainbow Riches, the wild symbols are not your stacked symbols. The stacked symbol is the game logo and it can become stacked. You can get an even bigger payout if you manage to get this symbol stacked along with the wild symbol of the game. Road to Riches bonus: The leprechaun is the bonus symbol and if you get three or more of this symbol you can activate the road to riches bonus round. In this round, you can spin a wheel to see what wager multiplier you can get, with the highest being 200x your wager. Wishing Well bonus: This bonus is a click me bonus if you get three or more of the symbol. You can get a multiplier of 2x to 10x in this way. Pots of gold bonus: If you get three pot of gold icons you can enter this bonus feature, in which you can spin the wheel to land either a bronze, silver or gold filled pot. Each of these has a multiplier hidden inside it and you can win as much as 500x your wager. Rainbow Riches is a weird game to say the least, but it still can throw you some great surprises if you are patient enough.